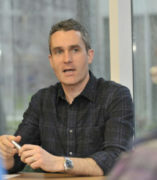 Phil Ashton joined the Urban Planning and Policy Program at UIC in August 2005. Initially trained as a political scientist and an urban planner, he worked as a technical assistance provider for existing and startup consumer cooperatives in Canada and the United States. For six years, he was a research associate at the Center for Urban Policy Research at Rutgers University, investigating neighborhood change in Newark, NJ and large scale urban redevelopment in Camden, NJ. He also actively consults on issues related to mortgage discrimination, lending disparities, and access to credit. Currently, Phil’s scholarly research focuses on three inter-related areas. His primary scholarly focus is the restructuring of retail finance and its relationship to U.S. central cities. His approach combines the methods of economic geography and industrial organization with theoretical frameworks emphasizing power relations between debtors and creditors. He has used this to produce a series of analyses of the subprime mortgage market that critique conventional interpretations of how minority borrowers and neighborhoods will fare in the “new financial marketplace.” With UIC colleagues Ralph Cintron and Glenda Garelli, he has also studied the money transfer industry and the formation of financial markets around remittances by migrant workers. He has published work on these topics in leading journals, including Environment & Planning A, Urban Studies, the International Journal of Urban and Regional Research, and the Urban Affairs Review . A second line of research examines urban governance through the lens of financial markets and financialization. Here, his approach examines the use of financial instruments and strategies as modes of problem-solving, and the new kinds of uncertainties and exposures those introduce to policy-making. With his colleagues Rachel Weber (UIC) and Marc Doussard (UIUC), Phil has done work on the role of investment banks and infrastructure funds in producing the growing market for urban infrastructure assets, including long-term leases for Chicago’s Skyway and parking meters. With Rachel Weber, he is also studying the emerging field of crowd-funding and attempts to use “crowd” mechanisms and imaginaries to solve problems of investment in urban revitalization. Finally, Phil is interested in the modes of credit market regulation capable of shaping a progressive path within financial sector reform. He has written on the Community Reinvestment Act and on the tensions in various civil rights frameworks as they have been applied to questions of credit access. More recently, he has engaged in a series of analyses of ad hoc financial regulation, including emergency banking interventions and legal settlements with large lenders over lending abuses and currency manipulation. The latter topic was his focus while a Visiting Scholar at the American Bar Foundation in 2013-2014. Ashton, Philip, Doussard, Marc, and Rachel Weber. 2016. Reconstituting the state: City powers and exposures in Chicago’s infrastructure leases. Special Issue on “Financialization and the Production of Urban Space”. Urban Studies 53(7): 1384-1400. PDF version available here. Ashton, Philip, and Brett Christophers. 2015. On arbitration, arbitrage and arbitrariness in financial markets and their governance: Unpacking LIBOR and the LIBOR scandal. Economy & Society 44(2): 188-217. PDF version available here.